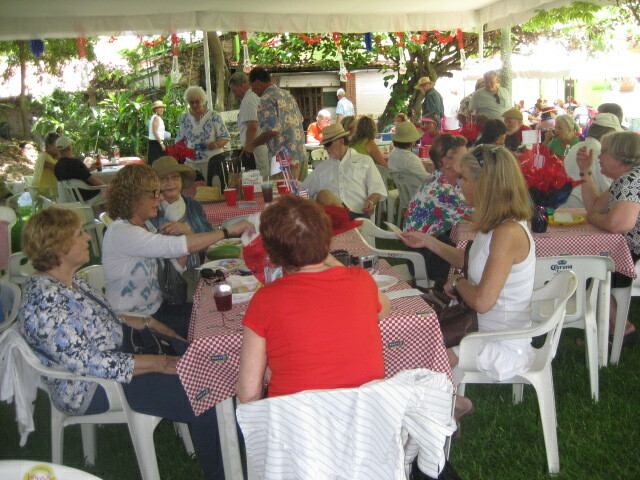 This year’s Can Am Celebration was a huge success. 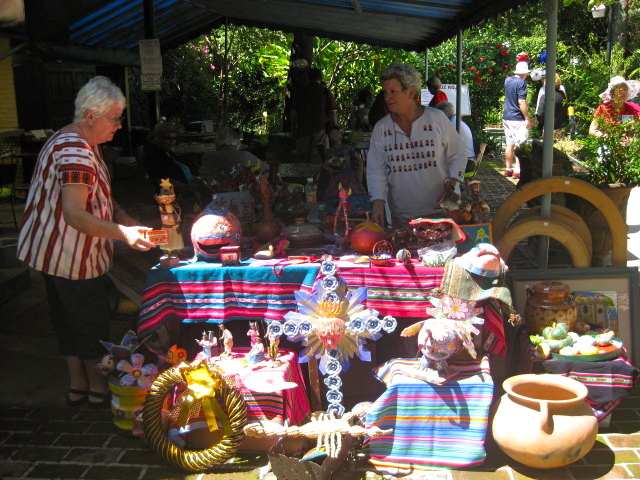 It is held every year on the Lake Chapala Society grounds. It is to honor Canada Day and American’s Fourth of July. This year it was on the second of July, which was last Monday, from noon to after four in the afternoon. I was there at the opening of the gate and stayed until the end. There was too much to see and do. I didn’t want to miss anything. I always look forward to this celebration. It is a chance to meet up with friends that I rarely see, eat delicious food, dance, buy books and videos, and many more interesting activities. Space is limited here so I will just highlight some of the booths and activities. I apologize in advance to the people I overlook. There was just too much to do and see and photograph. 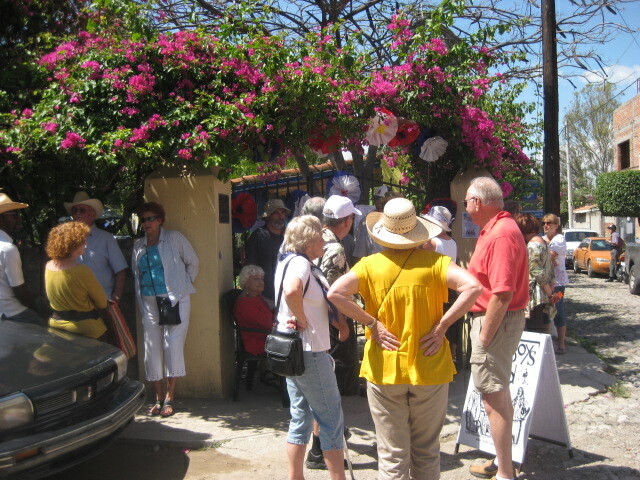 It was a sunny afternoon and people were anxious to get into the Lake Chapala grounds. No one was allowed inside without a ticket. You could either buy it in advance or at the gate. 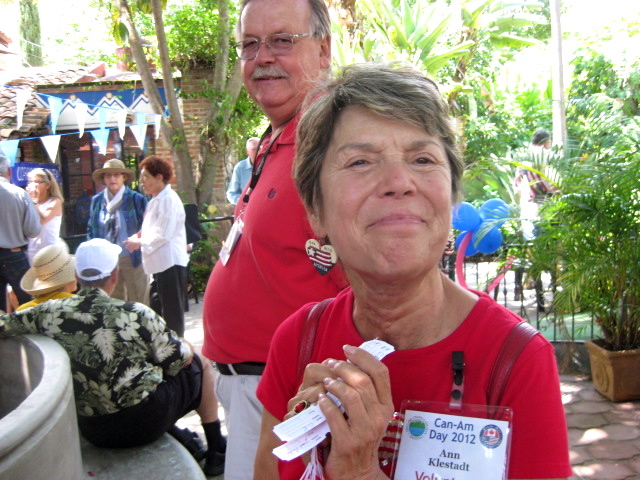 Ann Klestadt and her husband Charlie are very active members of the Red Cross. They were both selling tickets for the 50/50 raffle. Fifty percent went to the winning ticket holder and 50 percent went to the Red Cross. 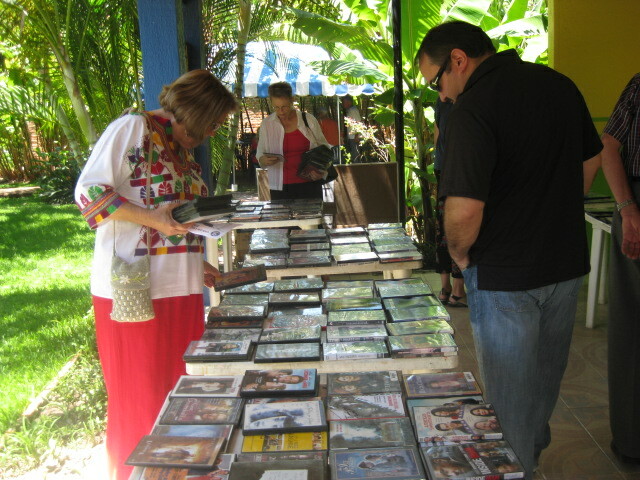 The drawing was at the end of the day and the winner walked home with over nine hundred dollars. Wish that had been me. 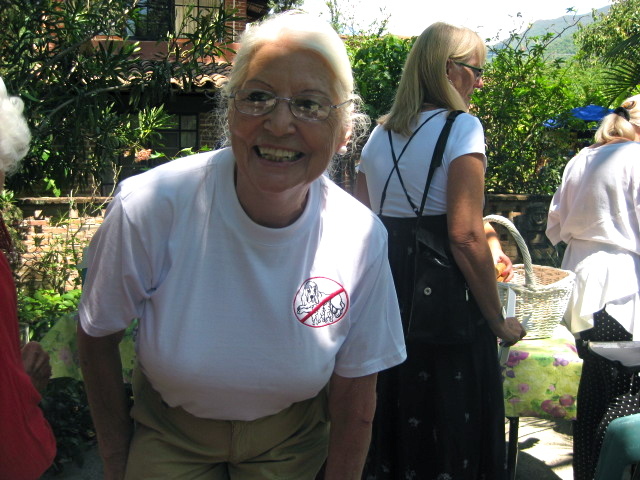 Several organizations served food. 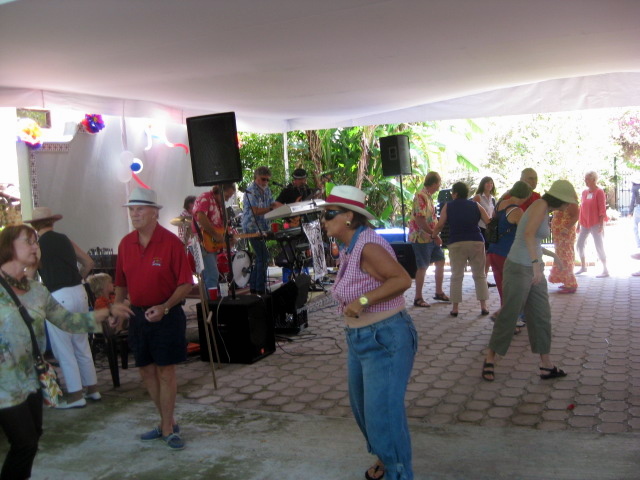 The main purpose of this celebration, besides having fun, is to raise money for nonprofit organizations here. 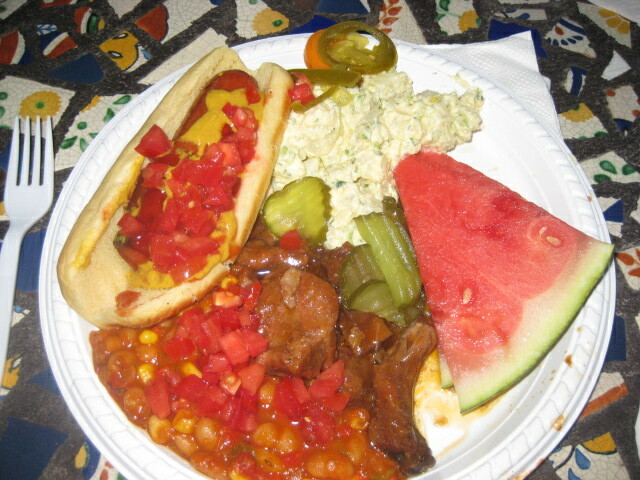 The Lake Chapala Society sold hot dogs, hamburgers, potato salad, beans, ribs. These lunches were so popular that they ran out of food a couple of times. They quickly replenished everything. 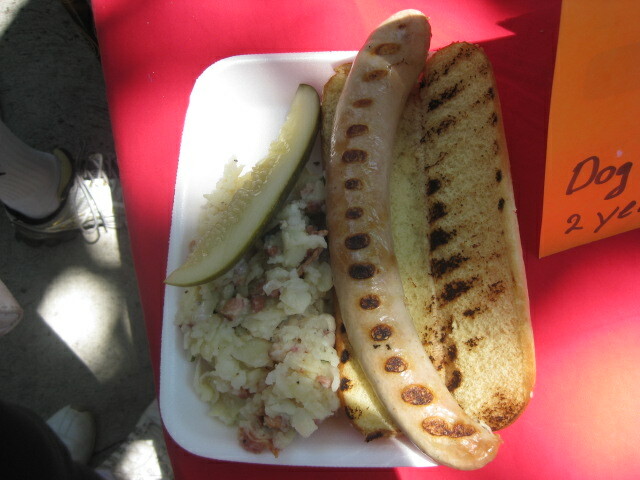 If you were in the mood for German food, you could buy a delicious Bratwurst and potato salad. 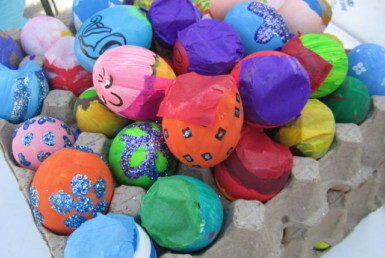 These were provided by the Lakeside Spay and Neuter Ranch & Adoptions. If you are interested in this organization, here is their web site: www.lakesidespayandneuterceneter.com They have spayed and neutered thousands of dogs and cats since 2001. They also provide a place for homeless dogs until they can be adopted. You can also contact Gudrun Jones if you are interested in helping out at the ranch or donating money to this cause. Her phone number is: 376-766-3813 or 331 431 7744. 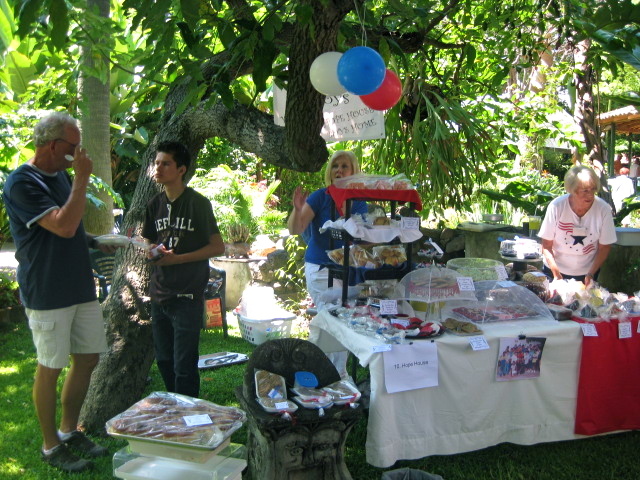 There were several tables where you could buy delicious desserts. 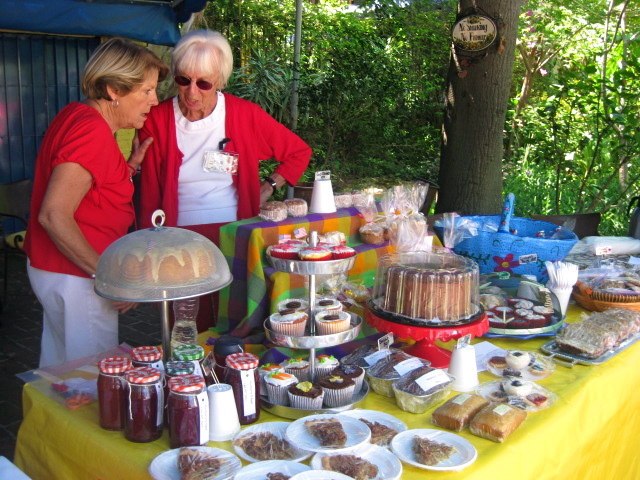 The Cruz Roja (Red Cross) had a huge selection of desserts. I ate too many of them but I always do that. They are delicious. 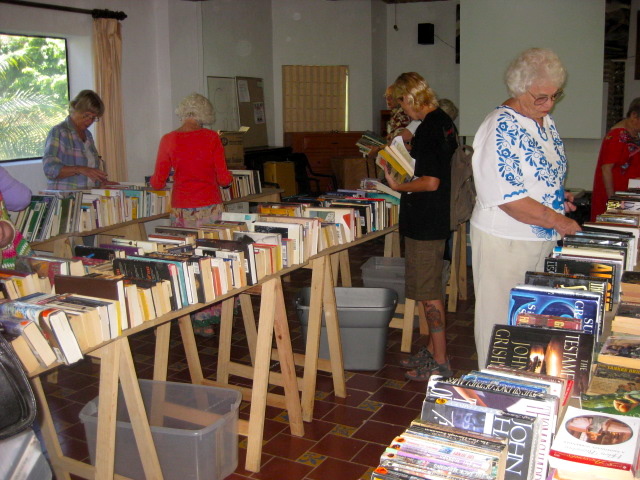 Lake Chapala Society had a book sale and a DVD sale. I loaded up on both. 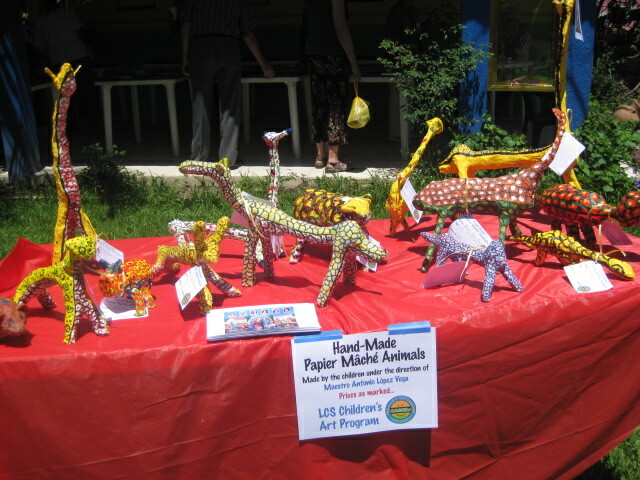 The LCS Children’s Art group had a table of wonderful Paper Mache animals made by the children. There is a group here called Storytellers. 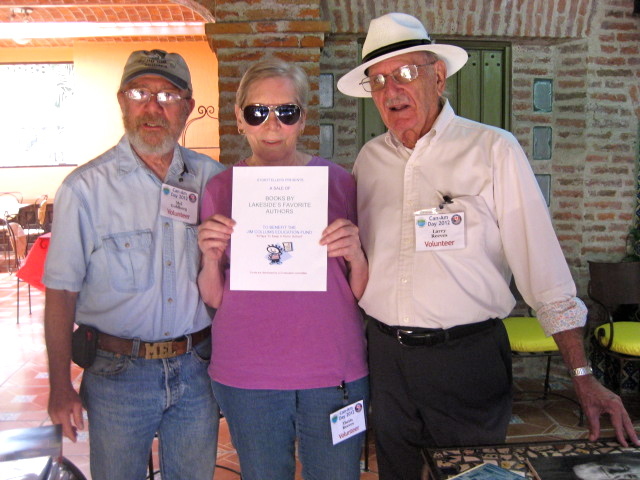 They were formed to honor Jim Collums, a local writer who passed away recently and the money they collect goes for an education fund to keep children in school. 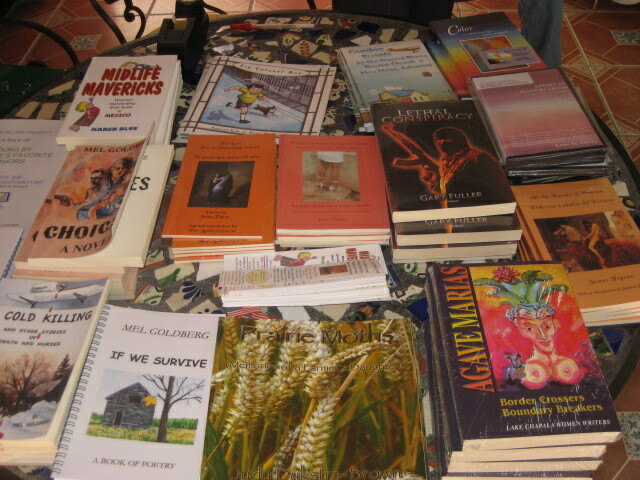 They had a book sale and also a table of books by local writers. There are many writers living in the Lakeside area. 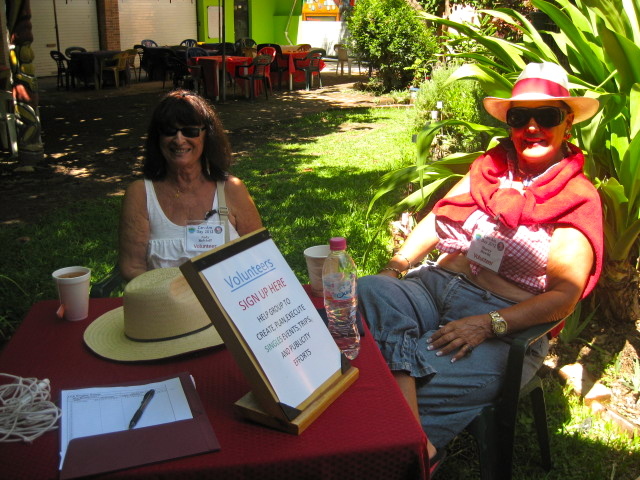 The Singles Group had a sign up table. 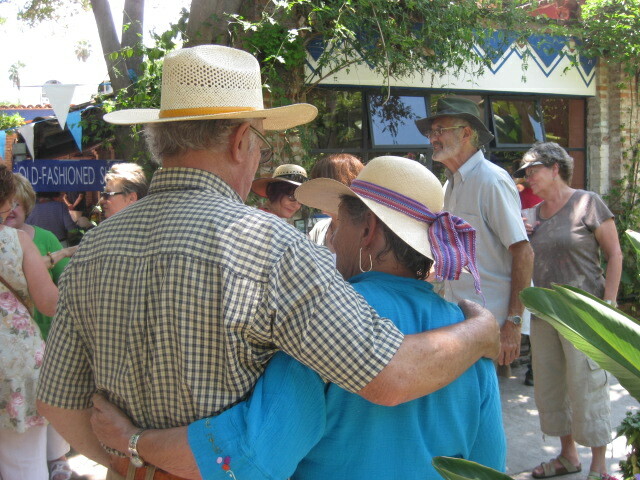 They have become very active in the community, providing a great service for all us singles in town. Needless to say, it is mostly women. 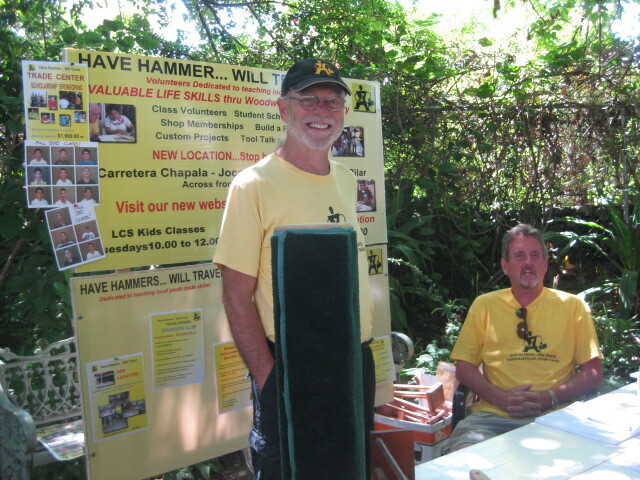 Have Hammers Will Travel is a group that teaches boys and girls how to work with wood. Their group meets on the LCS grounds once a week. The Tall Boys played up a storm and got people to dancing. It is hard to keep still when they are on the stage. As you can see by these photos, people were really enjoying the afternoon. I again apologize for not naming everyone and for missing many of the booths. 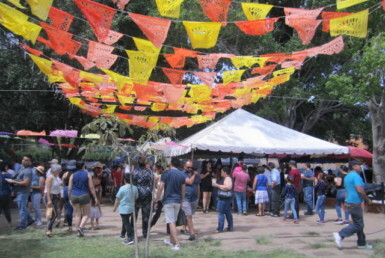 Here is a list of some of the booths that I missed. 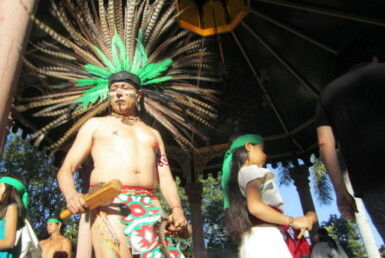 U. S. Voter Registration, Operacion Amor, Needle Pushers, Music Appreciation Society, Movimiento de Apoyo Menores Abandonados A.C. , Los ninos de Chapala, A.C., Luz de Malla, A.C., Community Safety Initiative, Asociacion Mexicana par la Superacion Integral de la Familia, A.C. I may have missed some others, I hope not. Maybe next year I will be able to write about the ones I missed this year. 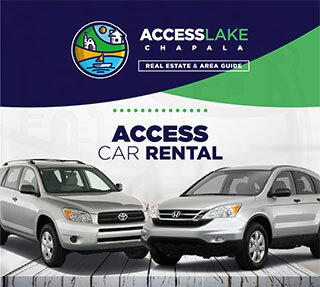 Evelyn, thank you for providing us with so many great articles and information on the Lake Chapala area. I just retired from the railroad and single. 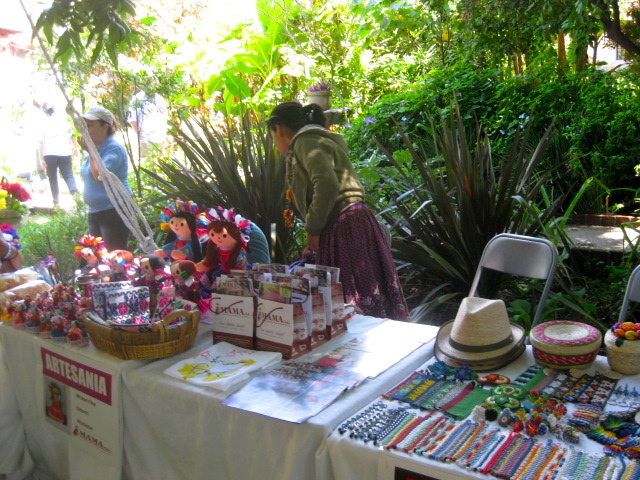 Getting ready to come and move to Lake Chapala area soon.